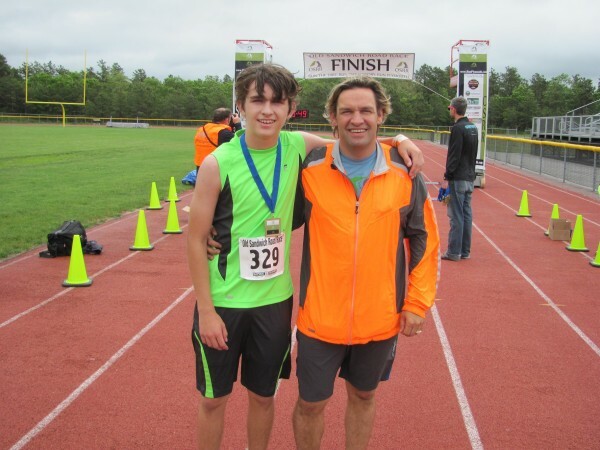 Collyn Brenner and Craig V. Brenner, son and father, work together to manage Plymouth area road races. In tandem with helping Whale and Dolphin Conservation manage the upcoming “Race to Save Species 5K”, Plymouth Rock Racing announces their new Non-Profit Division with a suite of special services to direct organized and financially successful road race events. Race to Save Species 5K is set for Saturday, May 3, 11 a.m. and will start at the Roo Bar, Cordage Park, Plymouth and continue along the waterside running path. Pre-registration fee is $27, race day registration fee is $30. For full race details, visit http://www.running4free.com/RaceDetails.aspx?raceid=303. “We are excited about both working with the Whale and Dolphin Conservation to move their race to the next level and to launch our Non-Profit Division to provide similar consultation and structure to assure the success of other charity road races,” note Craig V. Brenner, founder of Plymouth Rock Racing which directs 20 races throughout the year in Plymouth. Plymouth Rock Racing offers a turn-key solution for non-profit organization to manage the complexities of a road race including a step by step operations manual and workbook that covers the over 400 tasks involved; a marketing manual that provides a detailed outline of how to promote the race through social media, online presence registration sites, public relations and traditional registration flyers, postering and signage; consultation on race permitting and working with town officials and police departments; the specifics of marking the course, race timing, insurance, announcing and music services and photography services; resourcing course equipment such as generator, tables, chairs and Gatorade jugs; handling registration, finish line logistics; and post-event awards and celebration. Previously, Plymouth Rock Racing has assisted a variety of non-profit organizations including Run for Faith, Boys Scouts Girl Scouts of Hull, Run for your Mother (formerly the Earth Day Race and Run for One. For more information, please visit www.Plymouth RockRacing.com.